Recycled Fashion: Is thrift fashion a threat to the high street? Is thrift fashion a threat to the high street? One can't help but think, is DIY and thrift fashion, falling under the term slow fashion, really posing a threat to retail? Could this be the start of the end for high street fashion, or merely a short term trend? 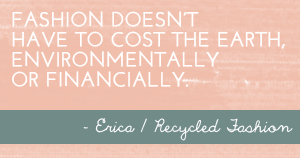 A quote from a post on Earth Diva's blog "What is Slow Fashion"
"Slow fashion isn’t just a trend that’s resulted from the green movement. Slow fashion is also a mentality. Retailers and designers who embrace slow fashion are doing just that: they’re slowing the pace of fashion, and its negative effects on people and the environment. Slow fashion is also built to last. It uses high quality materials that won’t break down after a season or two. So, customers can keep using it and wearing it for years. It’s fashion built to last." The term “Slow Fashion” was coined by Kate Fletcher in 2007 (Centre for Sustainable Fashion, UK). "Slow fashion is not a seasonal trend that comes and goes like animal print, but a sustainable fashion movement that is gaining momentum." Many individuals are learning to sew, creating their own clothes and accessories, alternatively buying other people's workmanship online, or buying second hand fashion, but how many of us are really shunning away from the high street? It is apparent there is a movement of worldwide DIY fashionista's. 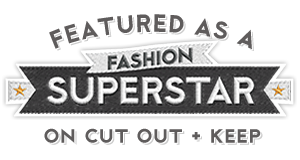 We only need to look at sites such as BurdaStyle, Outapop, DIYFashion, SewRetro, and my second home - Refashion Co-op, not to mention online marketplaces where we can buy handmade fashion garments. Anything vintage is popular right now, which these days can be categorised into any fashion dating back from the 1990s. A better term would perhaps be second-hand fashion, but who are we to argue when so many individuals are choosing thrift over new? Are we are seeing a rise against fast fashion? Cheap clothes we now understand utilise essential resources, which are both damaging to the environment, and often made in ethically immoral work (sweatshop) practices. But are consumers really changing their habits? Will we see our next generation continuing to buy new garments to keep on top of the impossibly fast paced fashion world in which we currently live, or will hand-made and thrift garments be the norm for our children? Erica, today, at a Vintage clothing / Craft Market I met 2 14yr old girls, beautifully and stylishly dressed, who were telling me about how they now ONLY Shop 2nd hand. Op shops, Markets, etc. They were both very aware of fashion, fabrics, etc. wonderful to see in 2 so young. Made my ♥ sing. The high street shops will not go away but will be forced to change for the better (and im not talking about the current greenwashing), works better than taxing, but I could talk about this one for hours. People have been profiting from the earth for far too long, and now we do know better it shouldn't be happening. I don't think we'll realistically see the end of the high street, it has its place after all, but there's definitely another shift towards individuality. Definitely hope slow fashion is here to stay - us crafty ladies just have to convince everyone else that it's the way to go. Love what you've done with that windcheater in the previous post, by the way. Great work! Fascinating post. I truly don't think its a passing trend. If it was places like Buffalo Exchange wouldn't have been in business since 1976! There whole business is based on secondhand clothing. I think you're seeing people thinking outside the box even more. At the end of my stay at buffalo exchange I heard a lot of the customers tell me they would go to GW/thrift shops and find it for themselves. BE was taking a decline in revenue too. This has been happening for about 8 years now. My son who is eighteen has never worn new...you heard me. Never, ok rarely. This year in a panic I bought him two pairs of shorts at H&M. I have been buying his clothes used since 1992. He now shops with me and picks out what he wants. Being young, he prefers places like BE but I think its just because mom takes to long at thrift stores. :) He has never ever thought twice about wearing used. I make a living selling resell clothes. I sell a lot of a few years model because people want to stick with what fits them. They know they can get those Ann Taylor pants for super cheap on eBay and its a sure winner. Will this last forever and ever? Tough to say, history says no. Compare the forties to the eighties. But even in the eighties there was that cult movement to buying vintage and used. I was one of them. Yes I got teased a lot. But can you imagine anyone being teased now? It's here to stay in one capacity or another. And if you think about it, do you rely more on whats hot from bloggers or fashion magazines? I know I get my inspiration from bloggers, thats a big step my friend. To be honest, I think fashion is starting to slow down. There have been a lot of articles lately about the strain that designers have to go through to launch 6 collections/year, and "Fashion Weeks" worldwide have proliferated insanely. I read somewhere that there are at least 150 Fashion Weeks globally. There's physically no possible way that even the most ardent fashionistas can keep up. I think a lot of the "slow down" process--that is, things staying trendy for more than one season--has to do with the current economic climate. People can't afford to spend as much money as they once did on fast-fashion trends, hence more classic silhouettes have been in style in recent years. This links to the whole DIY trend. Even though people generally have less money to spend on clothes, they still want to look fashion-forward and current. Thus, people turn to DIY to achieve those looks at a lesser cost. I always look at designer clothes to see if I can mimic their looks, since I can't afford to buy most of the pieces that I love--I even put up a tutorial for a Lanvin-inspired heel on my blog. I think that DIY is a trend that will rise and fall with the economy; however, as fashion is constantly diversifying, I think that DIY will have a steady long-term growth rate . . . especially as the Internet has made it easier to find inspiration and how-to guides.